Signs have been multiplying lately that Syrian President Bashar al-Assad is running out of time. Saudi Arabia displaced Syria as kingmaker in Lebanon (see my previous post). Stressing this today in her daily column for Beirut’s leading independent daily al-Nahar is well-known political analyst Rosanna Boumounsef. She believes Saudi Arabia’s comeback to Lebanon following the resignation of Prime Minister Najib Mikati has a regional dimension epitomizing the kingdom’s drive to isolate Assad. The drive kicked off at the Doha summit. There, the Syrian Opposition Coalition was asked to fill Assad’s vacant seat, and Arab League member-states won the individual right to arm the rebels. The latter decision is liable to boost the rebels’ firepower as they close in on Damascus. The Assad regime can’t draw breath from Lebanon and Iraq as before. For instance, Damascus is no more the undisputed overlord of internal Lebanese politics. It still commands the blind allegiance of some Lebanese political movements and organizations, but not necessarily Hezbollah’s. That’s due to regional and strictly Lebanese reasons. Because she is being seriously tested internally and over her nuclear ambitions and risks losing face in Syria, Iran – read Hezbollah – might have simply chosen to duck in Lebanon. In Iraq, Iran’s enforcer Prime Minister Nouri al-Maliki has his back to the wall. The sum total of this: the balance of power in the region is tilting against the Damascus government. Opposition forces are tightening their grip on a belt of communities to the northeast and south of Damascus, lobbing mortars into districts in the center of the capital, which they hope to storm within eight to 12 weeks. Rebel shells have hit landmarks in central Damascus, such as the Sheraton Hotel and the neighborhood of Abu Rummana, where many diplomats are based. State-run SANA news agency says several mortar rounds hit areas near the Tishreen football stadium on Saturday. The stadium is in the capital's central Barakmeh district. To the east, the rebels now appear to control Eastern Ghouta, which commands eastern access to the city, and are firing on Damascus airport. “A new exodus from Syria is under way as fighting edges closer to the heart of Damascus with those who swore they would never flee selling their belongings to escape a battle now raging on their doorsteps. “Many Syrians in the capital had insisted the uprising-turned-civil war would not reach the city center. Others said they would stay, no matter the consequences. “But fear has begun to grip even the most resolute residents. “For many the tipping point was the stream of mortar bombs and rockets” shaking Damascus (read more of Erika Solomon’s report for the Scotsman, “Syrians leaving Damascus…”). The Damascus daily al-Watan Wednesday quoted an official military spokesman as saying, “Damascus will remain secure and all Syrian army formations will be fully prepared to defend it. “The fate of whoever threatens its sanctity is inevitable death. “The army will not allow any terrorist to desecrate the soil of Damascus. We’ve repeatedly warned the terrorist gangs by all means possible that getting near Damascus means their and their leaders’ inescapable death. “All infiltration attempts to date ended with the death or flight of the terrorists. While the Syrian military was telling Damascenes to remain calm, cool and collected, Assad himself was scaremongering. He told Turkish TV channel Ulusal Kanal, “If the unrest in Syria leads to the partitioning of the country, or if the terrorist forces take control … the situation will inevitably spill over into neighboring countries and create a domino effect throughout the Middle East and beyond." Turmoil would spread "east, west, north and south. This will lead to a state of instability for years and maybe decades to come," he said in the interview, posted by the Syrian presidency on the Internet. While continuing to rain cluster and gas bombs, barrel bombs and Scud missiles on rebel-held areas, the Syrian army this week twice used a Russian short-range tactical ballistic missile called “Tochka” against opposition forces. The opposition’s Local Coordination Committees said a Tochka missile Saturday targeted the Damascus suburb of Barza. Another was used two days earlier against rebel positions in the capital’s Yarmouk camp for Palestinian refugees. The Tochka missile is erected vertically on a vehicle prior to launch for precise strikes on enemy tactical targets. The fragmentation warhead can be replaced with a nuclear, biological or chemical warhead. 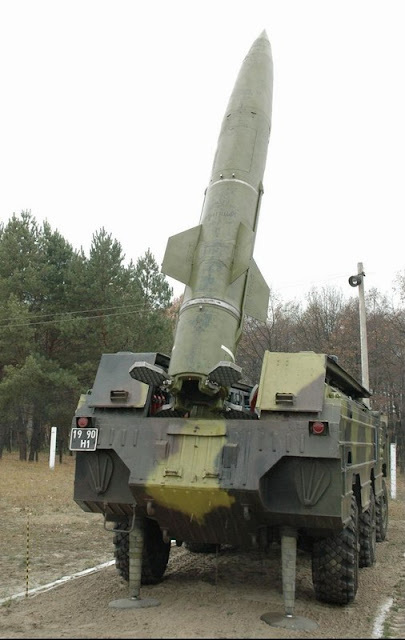 Russia used the Tochka missiles in the Chechen Wars. In April, about 14 Tochka missiles were fired into Barza on the northeastern edge of Damascus.